Kilroy is the prototype name for Wilda. 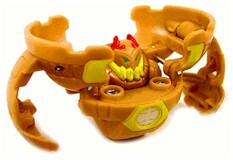 Wilda is a Bakugan and is the pre-evolved form of the Guardian Bakugan of Mira, the leader of the Resistance. Wilda has already evolved into Thunder Wilda by the time he was first introduced into the series. It's a massive creature made of rock and hardened clay, Wilda moves slowly during battle, but his incredible durability makes up for this. He can also pound the ground forcefully to rattle his opponents before finishing them with a powerful punch. Wilda is very powerful. Purchase Kilroy from Amazon now!